RS: What inspired you to write this eBook? DB: Rajesh, there is a lot of emphasis is our culture to fit in. Even as a kid, if you try to do something which is out of ordinary or lets say EXTRA ordinary, chances are you will be told “This is not how it works” OR “You can never do this” OR “Let someone else figure this out”. Also, for most of us, rich means material wealth. Our society has evolved to measure success as a function of our financial status. I am not saying making money is bad. Don’t get me wrong – being rich is definitely helpful. Money gives you freedom to work on what you want and with whom you want. It is really good if you don’t have to think about money. But what I found is that the RICH means different things to different people. Most successful people did not start with the motive to get rich. They were more interested in helping others. Increasingly, I believe that the cultural barriers are coming down, and a new generation of leaders who feel themselves to be citizens of the world, rather than simply Americans, Asians, Hispanics, African Americans are looking for a way to be part of a larger community and find their unique leadership styles. So, I interviewed 30 exceptional multicultural leaders who are women. Their self-belief and confidence apart, they were UNREASONABLE. They took full responsibility of who they could become. RS: What is the BIG idea of this ebook? This e-book can make one promise that if you had one reason for NOT living your DREAM – you will find that with the UNREASONABLE Rule Book – 11 UNREASONABLE RULES of success that will help you OWN your dreams. You will know how to live your life, use your own mind, go toward your dreams that you want to make REAL and SOLID. I went deeper with what I call “The 6C framework” – 6 common characteristics of leaders. I share these characteristics that give them the energy and vitality to get the work that needs to be done (to achieve their dreams). You will find excerpts of my conversations with these women and what they stood for. RS: What advice do you have for women do to grow as leaders? DB: Set your goals high. Understand what you know and what you do not know. Get educated about things that you do not know. Get a grip of what is your baseline and how you are going to achieve it. Brainstorm and vocalize what you want to do. You need to have the courage to talk out loud about what you want to do and that is also how you attract others to support you in your journey. RS: Who is the perfect person to read this book? DB: People with dreams, with a genuine desire to unleash their leadership potential, to become the person they always wanted to be, to become leaders, take action and make their ideas happen. Sadly, most people quit on their dreams . This ebook chronicles the best practices of those who defy the cultural barriers and limiting situations. RS: Deepika, If you had to pick a favorite from the 11 unreasonable rules, which one would it be and why? My favorite is Unreasonable Rule # 2: Be Fearless. RS: What is ONE more question that I should have asked you and what is the answer for that? Another question could have been: Why Pink? PINK is associated with being soft, touchy and cute. I believe these are positive attributes at any age of your life. I wasn’t going to let go of PINK so easily. 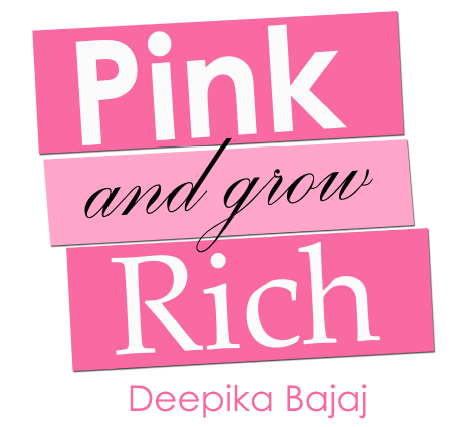 Here is my take on the NEW PINK: It is the color of passion – passion to create, inner strength and confidence. And so I choose PINK.